Trucks have started covering greater distances since the nationwide implementation of a unified tax regime, which led to the dismantling of interstate border check-posts, a study by the government showed. Trucks are travelling 300-325 km a day, an up to 44 per cent increase from the average of 225 km a day before July 1, when the goods and services tax was introduced, according to data collated by the Ministry of Road Transport and Highways. Previously, long-haul trucks and cargo carriers spent as much as 20 per cent of their transit time idling at interstate check-posts, where local transport authorities monitored the collection of sales tax and verified documents related to consignments, vehicles and drivers. "With the dismantling of state check posts, freight transit time has come down. There are no delays on account of Octroi," said a spokesman of an automobille company. 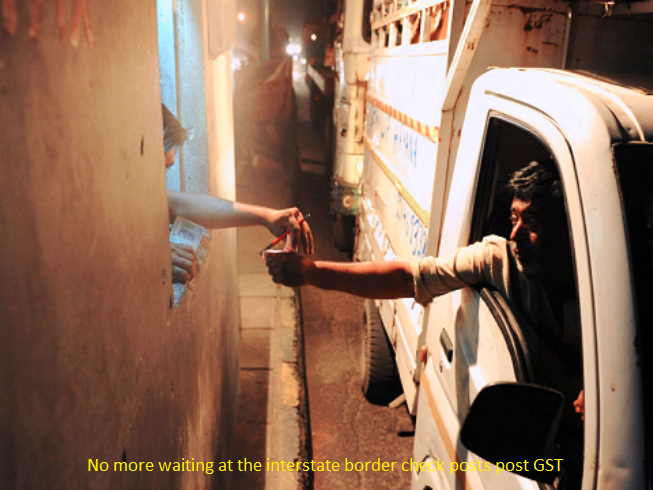 A study of freight transit time on the 1,660 km stretch between Chennai and Kolkata shows that of the 50-65 hours taken to cover the distance, 10-15 hours were spent at border check-posts, 5-6 hours were wasted on account of congestion and 1-3 hours were lost at toll centres before GST was implemented. However, some transporters said the improvement in truck movement hasn't been as much as expected and not all barriers have been cleared to facilitate seamless movement of goods. ..
On some routes, per day movement has gone up by 40-45 km but our trucks have the potential to do much more, at least 450 km per day," a spokesman of the truck industry. "Two major bottlenecks remain: RTO posts have not been abolished in all states, checks continue at interstate borders. Besides, a lot of time is wasted at toll plazas." Still, the enhanced utilisation of trucks and the simpler tax structure under GST have helped to reduce logistics costs to 10- percent of the total value of goods from 14 per cent earlier. Logistics account for 10 per cent and 8 per cent of the total value of goods in BRIC nations and major developed countries, respectively. Road Transport and Highways Minister Nitin Gadkari had earlier indicated that the logistics sector would stand to gain the most from the new indirect tax regime as costs would come down. Companies previously maintained warehouses in every state on account of varying tax structures. "A lot of consolidation is happening in the logistics sector as companies no longer need to maintain warehouses in every state. The hub-and -spoke model will become more efficient in the coming days."